It was eight degrees below zero this morning, but I had an outside project. I wasn’t out too long at any one time, but it was physical and I was glad for the warmth in the house when I could come in for a break. When the project was over, Alice read my mind, and mixed up a batch of our heavenly chocolate chip cookies. Now picture this… I had a glass of the iced tea I’ve made just the way I like it for decades, a plate of warm-from-the-oven chocolate chip cookies, and I was reading “The Lively Lady” by Kenneth Roberts. I was on the couch with our plaid couch blanket over me. I think I paused in the middle of all that, sucked in some air, exhaled slowly, and realized this is about as good as it gets. I think we must all be entitled to this feeling now and then. Today it was my turn, and I’m grateful for it. Tomorrow the cookies will no longer be warm, I’ll drink my tea after I’ve brushed my teeth, and so on. But I have a high point to compare with the rest of the moments that will make up my life. Oh, those molten chocolate chips buried inside a warm cookie. We have two woodstoves in the main part of our house, our kitchen stove and our Jotul heating stove. When the outside temperature is above the high 20s, the kitchen stove does a pretty good job keeping the house warm, with the added bonus that we get hot water and cooking capabilities with it. If it gets colder, we’ll usually switch to the big Jotul stove. This stove has a smoke channel that has a catalyst chamber in it. In theory, the hot gasses from the fire pass through the catalyst, and secondary combustion occurs. This gives us more usable heat in the house, and less pollution outside. The only downside is the catalyst canister needs a little maintenance. I suppose when we bought this stove 30+ years ago, the manual made a point of explaining our responsibilities towards the catalyst. If I read them, I must have forgotten them, because I’ve basically done nothing with it over the years. The catalyst is a honeycombed structure that can clog up with fine soot, and over the years, I think I’ve taken it out and cleaned it maybe 4 times. I did read the paper that came with the new catalyst, and learned I should inspect and clean it every month! And that they are designed to be replaced after about 12,000 hours of burn time. They claimed a stove in Northern Minnesota goes through 12,000 hours in 2 1/2 years! Our old one lasted over 30. So clearly we’ve mismanaged the catalyst on our stove. The consequences? We’ve gotten less heat out of our wood, and pumped more pollutants into the air. And, we’ve striped our house with a reddish brown streak. Alice and Steve do not like the way this streak looks. I have to admit it doesn’t bother me too much, but that the symptom should have alerted us to the problem with our stove sooner than it did. So hear ye! My resolution from this day forth is to treat my stove catalyst with more respect. And, as time permits, I’ll also try to do something about the house’s skunk stripe. 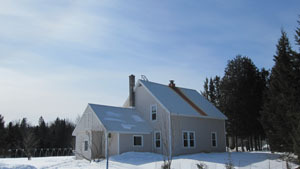 You are currently browsing the Rural Life in the UP of Michigan blog archives for March, 2013.